Has this been a long week for you? I know it has for me! I am busy in the kitchen and busy in my sewing studio getting ready for Christmas. My daughter will be home for almost a month on Christmas break! She is a Senior this year and is so very close to graduating from college! How does that happen? Anyway, lets get to the party! 2 Honey Coffee Sugar Scrubs: This scrub is an invigorating blend of Coffee, Honey, Sugar, and Olive Oil that will exfoliate, hydrate, nourish and tone the skin. 1 Honey Sugar Scrub: This nourishing scrub will exfoliate and brighten the skin while moisturizing and soothing redness and swelling. Also, while I have your attention – don’t forget the Gingerbread House Competition! Your host and co-hosts for the week! We would love it if you would take a minute and visit one or two! Can’t wait to see what you have to offer! Hi Cynthia! thanks so much for stopping by The Alchemist. I’m so glad you like my Hot buttered Rum recipe! And thanks so much for the pin and mention on facebook, that’s awesome! I started following you too. Happy Holidays and I wish you a great weekend! I bet your e so excited about the baby coming home. Love body scrubs and Ive been pinning recipes for home made ones for a while now. Just need to find time to chuck one together ! Scrolling down to comment and seeing all those yummies….my gosh! Torture….haha! I am excited to be a part of Foodie Friends Friday for the second week. There are some great things coming up with Foodie Friends Friday. Stay tuned! First, let’s visit the other sponsors. 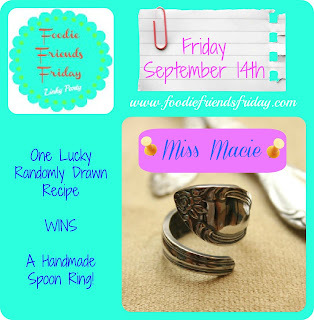 This weeks prize for one lucky winner will be this lovely ring from Miss Macie! Isn’t it wonderful? Please, remember to link the recipe you are submitting back to Foodie Friends Friday or Feeding Big. You can link up to 3 recipes! I would love it if you would follow Feeding Big and/or my facebook page.